Thank you for your interest in volunteering at the Columbus Museum of Art, where 1,400 volunteers help the Museum to fulfill our mission. Our volunteer program is varied and flexible. Museum Auxiliaries support the Museum through their fundraising, service, and outreach activities. They also provide social and educational opportunities for their members, Museum visitors, and the children of central Ohio. Museum Auxiliaries have specific application procedures, membership requirements and financial obligations. Each has it s own mission, and all are self governing. All Auxiliary members must maintain a Museum membership. If you are interest in joining an auxiliary, the Museum’s Volunteer Administrator will ask the group’s membership chair to contact you to provide additional information and an invitation to a meeting or event to familiarize you with the group and determine if this is the right fit for you. To receive additional information contact Tiffany Duncan. An auxiliary of the Columbus Museum of Art since 1946, Beaux Arts is a volunteer organization whose members are interested in the arts and committed to the idea that the museum is a dynamic force for community culture and education. Beaux Arts sponsors the fundraising event Art in Bloom at the Museum biennially in support of creative programming for all ages. 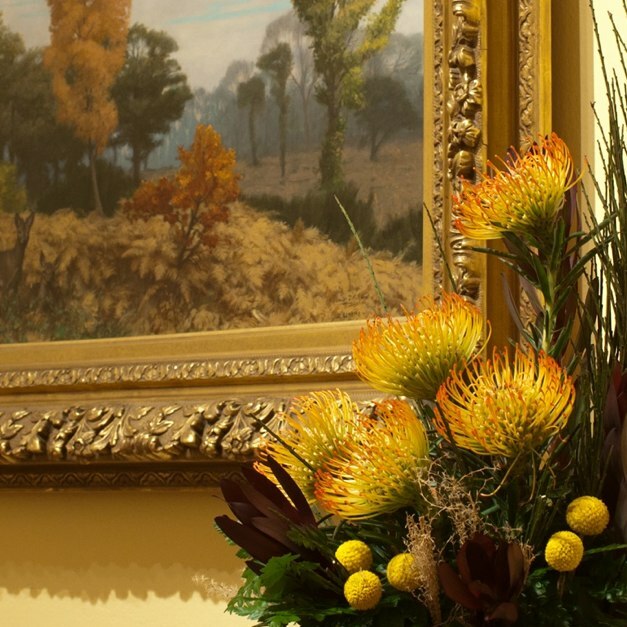 Art in Bloom brings the Museum galleries to life through imaginative floral designs paired with works from the CMA collection. Members also volunteer at art-related events throughout the year, hold monthly meetings that often include art-related programs, and have the opportunity to participate in social and cultural activities planned by the group. Annual dues are $25 for active members, and members must maintain a current membership at the Columbus Museum of Art. For more information on joining Beaux Arts, contact us here. In the spring, Women’s Board presents Decorator’s Show House, the biannual transformation of a home into a Decorator’s Show House by interior designers and talented landscape architects. Members enjoy special holiday parties, coffees, teas, and art-related events. Consider attending the Information Session for the Class of 2019 on Thursday, July 26, 2018 from 4:00-5:30PM in the Talmage Conference Room at the Museum if you are interested in learning more about our robust Docent Program. Application materials for the 2018-2019 class are due by August 15, 2018. Click here to download the application. If you would like information about the upcoming docent class, please email Stephanie Samera. This group is open to Docents that have fulfilled a four year commitment and want to retire from active duty as a gallery educator. They have social and art-related events for their members and through their dues, support the active docents by sponsoring lecturers for trainings. They also are invited to attend Docent trainings. Visitor Experience and Development Event volunteers are an essential element of the museum’s frontline. They assist in creating a friendly and comfortable environment for visitors as they experience the museum. They warmly welcome guests, distribute information, handle registration for internal events, complete surveys for interdepartmental teams and answer questions about the day’s events. As a volunteer at CMA, all curator talks, docent trainings, lunch-and-learns and other staff training sessions will be open for you to attend. If you would like to become a hospitality volunteer, please read and complete this brief application. Please contact Lisa Collins at Lisa.collins@cmaohio.org for details.